This course was featured by National Geographic® in an article about activities in Zion National Park called 5 Perfect Days: The Ultimate Itinerary. Once a pursuit of only the extremely adventurous, canyoneering has evolved into a more popular and well-known activity. Rock-climbers, cavers and mountaineers used to adapt their knowledge and equipment, and accompanied by a little luck, make their way down the canyons. Since those days, canyoneering has progressed into sophisticated and highly specialized set of equipment and techniques that differ from rock climbing, caving and mountaineering. 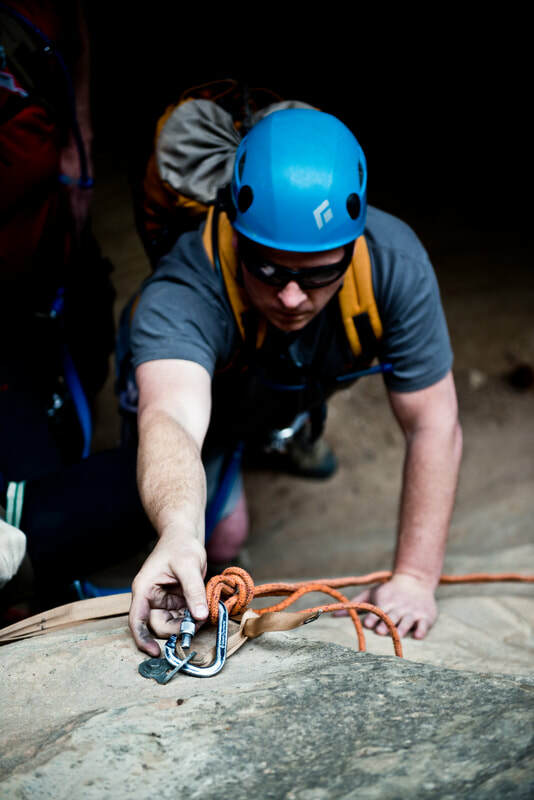 This Three Day Basic course follows a scaffolded curriculum to progress you from your current competencies into a self-guided canyoneer. It will provide you with the technical skills to be a contributing team member with other competent canyoneers, and to have an awareness of the risks to be able to safely navigate and assess situations that might arise. This is the perfect course to prepare you for self-guided descents of canyons such as: Pine Creek, Mystery, Spry, Telephone, Behunin and Fatman’s Misery. Call us for more information and to schedule your course today. We provide all the necessary technical gear, though you may bring any that you already own and wish to use in the field. We recommend owning your own harness and helmet if you foresee using them after class. There are many different tools that you can purchase but many are unnecessary. Request a dialogue with your class instructor prior to investing in a bunch of gear for this course.